The diverse Canterbury region is bounded by the Southern Alps to the west, and the Pacific to the east. Travellers to Canterbury will find the landscapes from many different continents within this region. So whether you are seeking a relaxing day on the beach, or an exciting night out on the town, or a day skiing, it can all be done in Canterbury. The Canterbury region incorporates Christchurch, Kaikoura, Hanmer Springs, Timaru, Mount Cook, and Arthur's Pass. In the northern end of the large province of Canterbury lies the seaside settlement of Kaikoura. Kaikoura which translated from Maori means "to eat crayfish" is a seafood diner's paradise. The Kaikoura township lies within the Southern Hemisphere Whale Sanctuary and is famous internationally for it's eco-tourism. Several different species of whale can be seen on the whale watching boats depending on the time of the year. Visitor's will also enjoy the opportunity to watch fur seals sunning themselves on the rocks and the abundant array of seabirds enjoying the rich sea harvest. Inland from Kaikoura in the rugged mountains you will find the mineral Spa Resort of Hanmer Springs. The therapeutic sulfuric springs have been enjoyed by visitors for over 100 years. Thrillseeker's Canyon offers many adrenaline-pumping opportunities, including bungy jumping, white-water rafting, jet boating and mountain biking. The largest city of the South Island is "The Garden City", Christchurch. 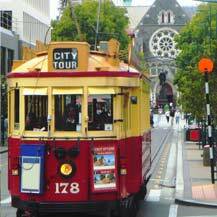 Christchurch has a lively entertainment scene, strong cultural heritage, gorgeous parks and gardens, lots of sports facilities and good shopping. 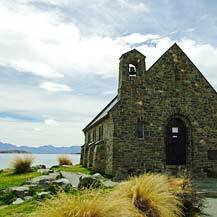 Among the ‘must sees’ are the weekend Arts Centre market, Christchurch Cathedral, Botanic Gardens and International Antarctic Centre. Christchurch has many great beaches to enjoy and in winter there are many great skifields within 2 hours drive, including Mt Hutt. From Christchurch, cut across the Canterbury Plains and ascend the Southern Alps to Arthur's Pass. Arthur's Pass is easily accessible by car, or on the world-famous TranzAlpine Express train journey. Arthur's Pass National Park offers year-round outdoor recreation, from hiking and fishing in the summer months, to skiing and ice skating in winter. The only French settlement in New Zealand is Akaroa, 80 kilometres south east of Christchurch on the Banks Peninsula. The lovely bayside town is a well-preserved gem of history. Stroll along rue Lavaud, rue Jolie and the waterfront to see the quaint cottages, and find a bouquet of "cuisine France". Daily harbour cruises give you a unique opportunity to see the rare Hector’s dolphins, little blue penguins and New Zealand fur seals. Asburton draws keen freshwater anglers from all over the world, to fish the braided channels of the Rakaia, Rangitata and Ashburton Rivers. Sea-run trout and huge salmon (November to March) are caught here. Timaru, Canterbury's second largest city, is a popular holiday destination. Caroline Bay is Timaru's main attraction, drawing many visitors to its safe swimming beaches and popular annual carnival. For more information on things to do and places to stay in beautiful Canterbury please use the links below.